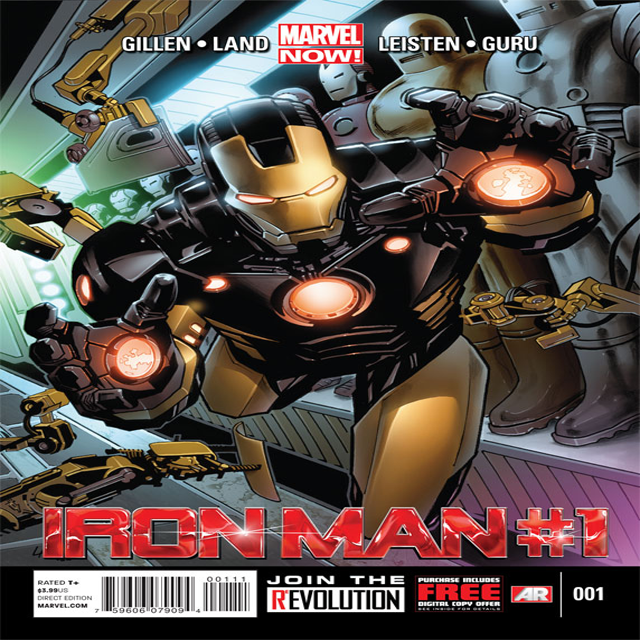 Next up for my comic book jones is Marvel Now's Iron Man series. Now I can't front, growing up I was never a fan of Iron Man. As a 8 year old reading comics, an alcoholic, womanizer with a bad ticker in a some super suit of armor just didn't do anything for me. Now as a 38 year old battling high cholesterol and seeing both Iron Man flicks and the Avengers movie, I can say Tony Starks sparks my interest a 'lil now so I figured I'd give this new Iron Man series a go. The series sets off with Tony doing what Tony does, drinking and picking up chicks to take back to the crib til he gets a call that some hi teknology (one of my fave producer's album btw) has gotten into the wrong hands and that "extremis" is loose. Tony then jumps into Iron Man mode to take out some cats who are trying to sell the technology and finds out that 4 others also have their hands on it who he'll have to go after. Only time will tell if this series can keep my interest cause like I've said before a lot about me diggin' a super hero is what villains they're matched against and to my knowledge, none of the villains Iron Man go against have any real depth to 'em which is probably why I can't name one of 'em now. So we'll see if this new Marvel Now revamp can change that. If not, I'm sure that even at 38, an alcoholic, womanizer with a bad ticker won't be able to hold my attention long.